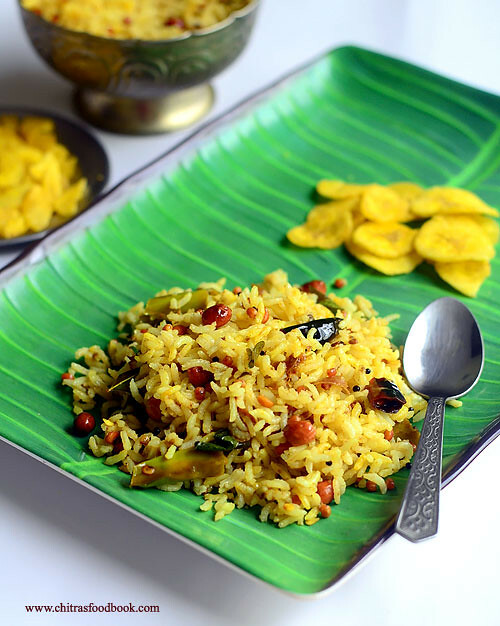 Andhra Pulihora also known as Chintapandu Pulihora in Telugu is a must try recipe during festival time. As Varalakshmi Vratham is fast approaching, I thought of sharing some Andhra style neivedyam recipes for this festival. This morning, I was asking my friend Megha about Varalakshmi Vratham special recipes as her MIL belongs to Andhra. She suggested recipes like Boorelu, appalu, Garelu and Pulihora. 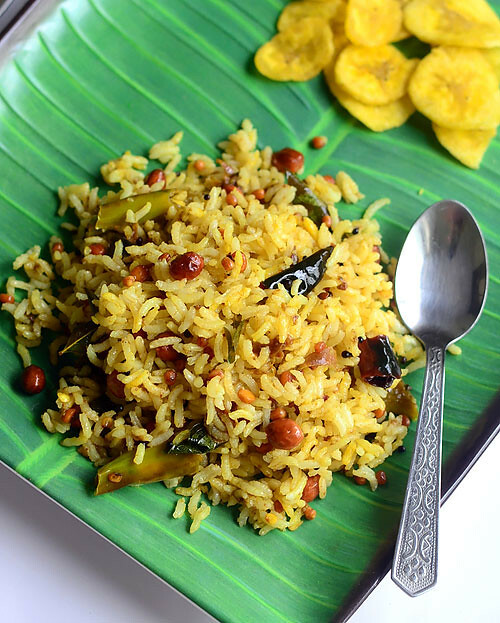 As our family is a big fan of tamarind rice, I started with this recipe. 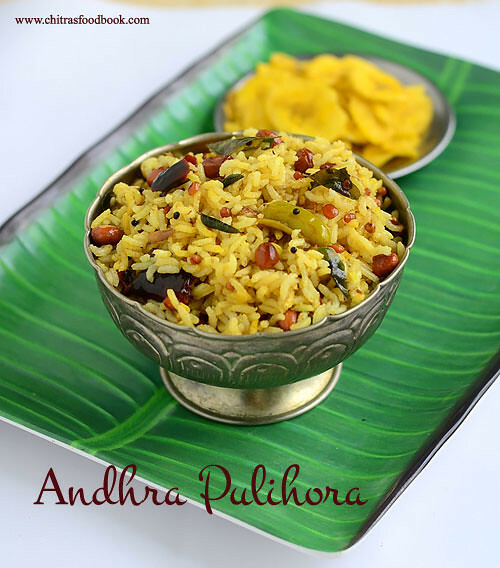 The ingredients and preparation of Andhra Pulihora is completely different from our Tamil nadu style Puliodharai. 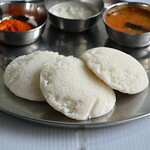 Its a very simple recipe without any grinding job. In the traditional temple style pulihora recipe, they add sesame seeds powder or mustard powder. 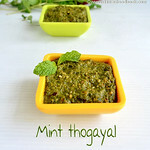 But I made the basic version as told by Megha and watched Attammaa TV YouTube video recipe too for more reference. This Puliogare paste i.e. 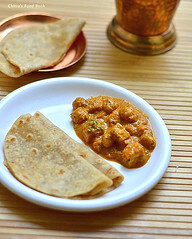 Pulihora Pulusu can be quickly made in minutes if you have readymade tamarind paste in hand. 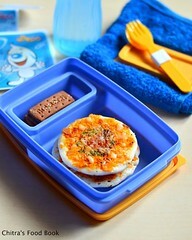 Its an ideal choice for quick lunch box recipe. Raksha loved it a lot and asked me for second serving as well. But this pulihora needs a standing time of minimum 2 hours for all its flavors to blend well. So friends do prepare this rice at least two hours before serving to relish its actual taste and flavor. 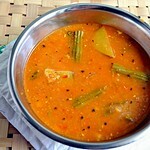 Now lets see the step by step recipe of how to prepare Andhra Pulihora / Chintapandu pulihora in detail. 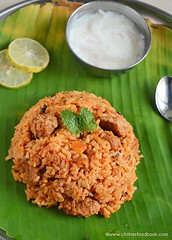 Check out my Tamil nadu style Puli Sadam and Pepper Puliogare recipes too. Soak tamarind in 1 cup of hot water for 10 minutes. Wash and pressure cook the raw rice adding water and few drops of cooking oil. Cook the rice for 2 whistles in low flame and open the cooker after steam is released. Spread the rice in a plate and add 1/4 tsp of turmeric powder, 1 tsp of cooking oil. Mix well and let the rice cool down. Heat 1 tbsp of oil in a pan and roast the peanuts. When the skin of peanuts starts to crackle, add the chana dal ( If you soaked chana dal, drain the water completely and add it. ), urad dal. Roast till golden brown.Remove and add them to the rice plate. Do not mix the dal with rice. This helps to retain the dals and peanuts crunchy while eating. Mix well, check for salt and give a standing time of 2 hours. It is also very important to keep the pulihora covered. This tip is also shared by Sujata. 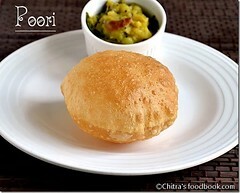 Serve with chips or papad. Enjoy ! Note : You can add 1.5 tsp of dry roasted and powdered white sesame seeds or 1/2 tsp mustard seeds powder over the rice while mixing to get temple style flavor.It gives an extra punch for this dish. Standing time is necessary to enjoy its actual taste.Add more chillies and more oil as per your taste buds. Yummy Andhra pulihora is ready. I served it with Kerala Nendran chips. Combo eppudii ?? 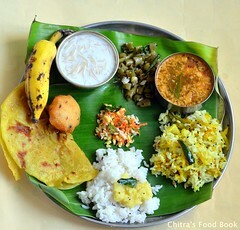 Hi Chitra. 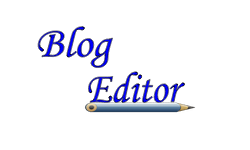 Your blog is lovely with good recipes. Thanks for your recipes. 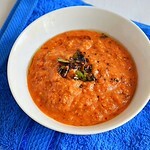 1. chana dal is soaked in water for about 1/2 hr. and then added to the oil to fry. 2. Hing is soaked in one teaspoon of water for 15 mts;. After 15 minutes, mix well with fingertip, then add the water to the rice & mix well. You may try these out and see the difference. Oh great tips. I will follow it :) Thanks for sharing ! I love this rice variety! Some people add jaggery too, right?